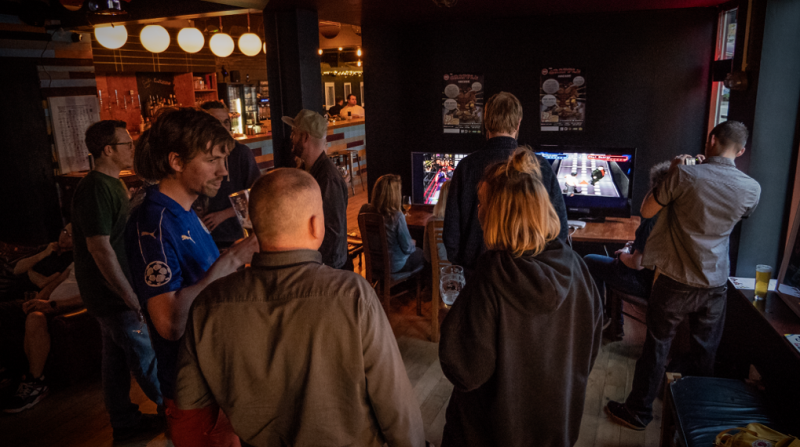 After the success of their debut event in April, the Grapple Arcade are organising events around the North East and beyond. If the idea of playing retro wrestling games whilst drinking craft beers sounds appealing, then you can hit up Grapple Arcade on Tuesday 5th June at the Giraffe Lounge, Newcastle upon Tyne. It’s totally free entry with food and drinks offers too. You can also get your grapple on at the Ryton Retro gaming event on Saturday 26th May. You can snap up tickets here. There’s also the North East Retro Gaming (NERG) event on Saturday 14th and Sunday 15th July and you can find tickets here. It’s in my top 5 of any game, not just wrestling. The intro is simply brilliant. It uses real footage much like the SmackDown! T.V show from the same time period and it helps to create the nostalgic element before you even start playing. The size of the roster and game modes is insane, almost overwhelming. The gameplay is perfect. It requires elements of timing, the button configuration is straight forward and it’s fast paced. It feels like an arcade game. I seriously can’t fault the game at all. Even small glitches such as animation drops are completely outweighed by the positives. The ‘create a wrestler’ (CAW) and create a PPV options are highly detailed and incredibly fun. For me, it’s the perfect wrestling game. The first arcade machine I spent a fortune on playing. Weeks of pocket money bear hugged out of my pocket due to the allure of ‘INSERT COIN – BUY IN’. I first played it in an arcade whilst on a caravanning holiday in Hastings. I saw the infamous pre-match screen image of ‘Mean Gene’ interviewing the Legion of Doom. I was in awe and I was hooked. It was the first time I had joined in playing on a 4 player arcade cabinet with people I didn’t know. Typically, we were best friends afterwards and chatted in depth about Earthquake squashing Damien. I’ve been tempted to find a table top arcade with this pre-installed for a while now, but until then, I’ll have to settle for playing the original at NERG on July 14th. AKI have developed some incredible wrestling games over the years and No Mercy was arguably the best on the Nintendo 64. In fairness, all of their PAL offerings between 1997 and 2006 were of a really high standard, but No Mercy tips the scales for me. It was simply the correct balance of everything. From the mechanics of the game, the customisable content, the bulkiness of the story modes and the interactive environments. It was a very well rounded game, not forgetting the hours of time spent playing multi player mode with friends. It was up there with Golden Eye and Mario Kart 64 in regards to how often 4 controllers were plugged in. I’ll be honest, I’d never played the game until the 2000’s, I know, shocking, but when I finally got my hands on it…WOW. My brother bought it, for what I believe was my 20th birthday, so naturally I did what any 20 year old would do on his birthday, I asked my housemates to give me some privacy, I shut the door, hooked-up my SNES and opened several beers. This is my favourite unlicensed wrestling game. Now a lot of people will disagree and say that a game from the Fire Pro series is the best unlicensed wrestling game, but I’d argue that only 10% of those people know how to play it. Yeah, fighting talk. In all seriousness, the reason SNSM gets my vote is because it’s incredibly different to other wrestling games. It was developed and published by Capcom, so it naturally feels like a Street Fighter 2 or SNK style SNES game. So if you’re a fan of those, you’ll enjoy this. The Grapple Arcade collective had been hammering SmackDown! Here Comes the Pain on the PS2 for several months and it was great. In fact it arguably could have made the top 5, however, after almost a year of playing it, we needed something different, a new flavour so to speak and BOOM, and there it was, Def Jam: Fight for NY. Now Def Jam Vendetta was a decent enough game but NY was a different beast entirely. It had a complete face life, reducing the cartoon looking characters from Vendetta, it added realism whilst keeping the all important element of an AKI developed game. The fact you could now create a character from scratch gave the game a new life form and created hours of entertainment. Put it this way, Henry Rollins teaches you how to fight Snoop Dogg. Yeah. Honourable mention goes to the Fire Pro Wrestling series. Narrowly missing out on the top 5 due to it taking months to understand it’s timing mechanism. It’s an incredibly difficult game to play, but once you’ve got to grips with it, Fire Pro could easily make your top spot. The next Grapple Arcade is at the Giraffe Lounge, Newcastle upon Tyne on Tuesday 5th June.